Latest News: You can make your advanced bookings for Le Mans Classic 2020 now.! The confirmed dates for the event are the 3rd – 5th July 2020. Please call us now to reserve all your tickets for Le Mans Classic 2020. 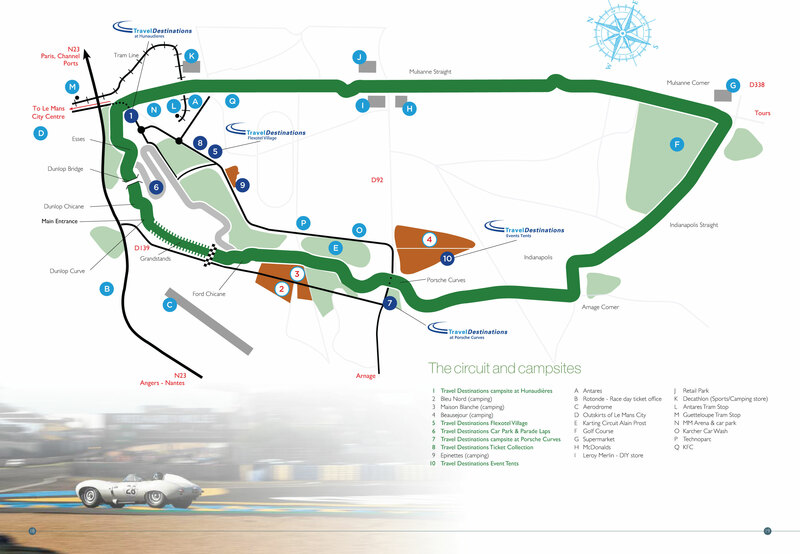 The campsite Le Pont Romain is situated to the East of Le Mans, just 6 miles from the Le Mans 24 hours circuit. It is an idyllic French campsite stretching over 2.4 hectares, including a heated outdoor swimming pool & activity room. There are a total of 70 camping pitches, each 100m² with access to electricity. There are separate male and female toilet blocks each providing hot showers. Spaces for motorhomes and caravans are strictly limited and twin axel vehicles and caravans are not allowed in this campsite. Pets on a lead are accepted. Single occupancy & motorhome prices are available on request. The campsite Le Pont Romain is available as a 4 night stay (Thursday – Monday) for the Le Mans Classic. 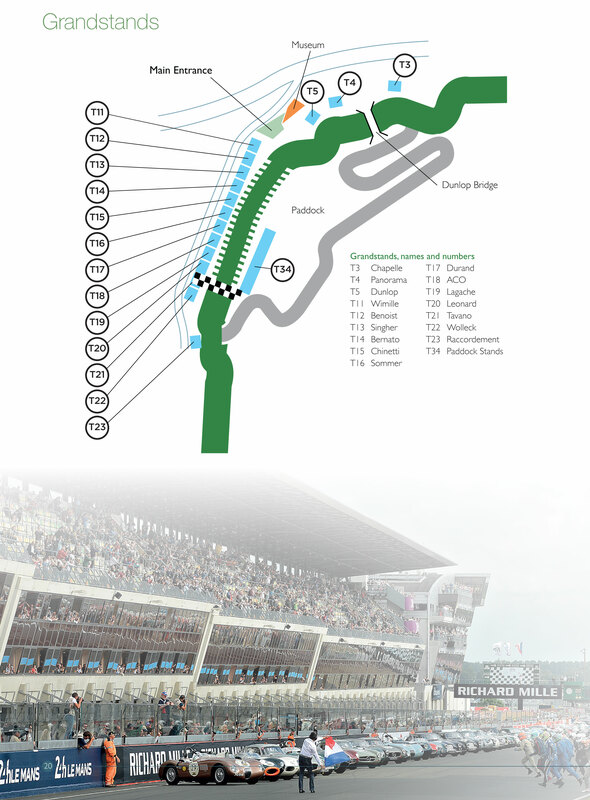 Grandstand Seats: For the Le Mans Classic 2020 grandstand seats need to be purchased separately if required. Grandstand seats start from £55.00 per seat. Circuit Laps: We will have a limited number of track laps available for our customers. Only qualifying cars will be allowed on the circuit during Saturday morning. Circuit laps can be added to our camping offers at the time of booking for £199.00 per vehicle. Helmets are compulsory. Vintage Bus Tour: A lap around the circuit on board a vintage bus can be purchased from £50.00 per person. Helicopter flights: Short helicopter flights over the circuit during the race weekend can be added to your booking for £150.00 per person. Picnic Baskets: Official Le Mans Classic picnic baskets (for 2 people) can be purchased in advance for £85.00 per basket. The baskets can be collected at the circuit on the mornings of Saturday & Sunday as required. Privilege Hospitality: Access to the official hospitality area in the welcome building overlooking the track for Saturday and Sunday. Includes breakfast and 3 course lunch on both days & dinner on Saturday evening. There is an open bar throughout. VIP parking and shuttle transfers are available. £990.00 per person. Deposit: A deposit of £100.00 per person must be paid at the time of booking to secure your reservation. Any bookings made within 12 weeks of travel must be made in full at the time of booking. Recorded Delivery: Most UK ticket packs will be posted by recorded delivery at a cost of £6.00. Ticket packs for groups and overseas mail will be priced accordingly. Please ask for details. Brittany Ferries: Crossings are also available from Portsmouth to St. Malo at a supplement of £120.00 per vehicle. Fast Ferries: Fastcraft crossings with Brittany Ferries are available from Portsmouth to Cherbourg at a supplement of £55.00 per car. Condor Ferries: Sailings from the Channel Islands are available on request. Travel Insurance: All customers should have their own travel insurance when travelling abroad. You can book your travel insurance online here.